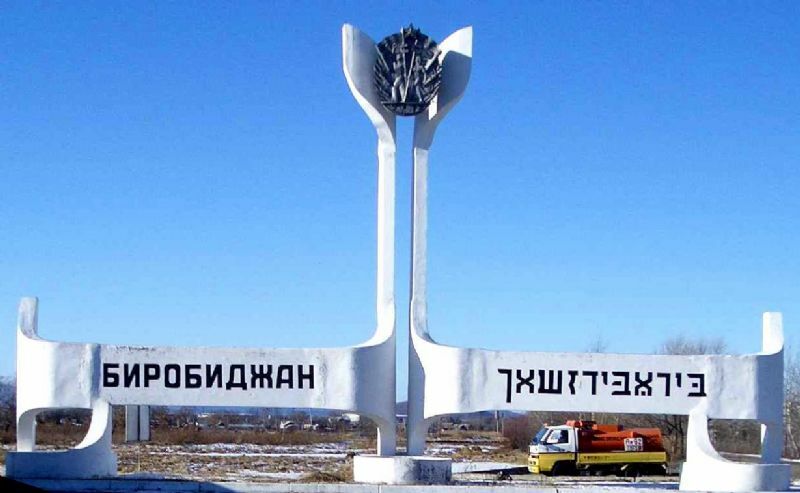 The capital of the Jewish Autonomous Region, the city Birobidzhan, is not a mass tourist destination but for those interested in the history of Jewish settlement in the Soviet Union it is highly interesting. The city is located about 8,000 kilometers from Moscow. For many years, the region was closed due to its proximity to the Chinese border. Nowadays, after many barriers have fallen several ways to reach Birobidzhan have opened up. The fastest means is a flight to the nearest major city Khabarovsk, the unofficial capital of the Russian Far East and about a two-hour journey on the Trans-Siberian Railway or by public bus to Birobidzhan. Several years ago, a bridge was built over the Amur River, allowing vehicle travel from the right bank, the Khabarovsk region to the left bank, the Birobidzhan region. This prestigious work stars on the new Russian 5,000 ruble note. 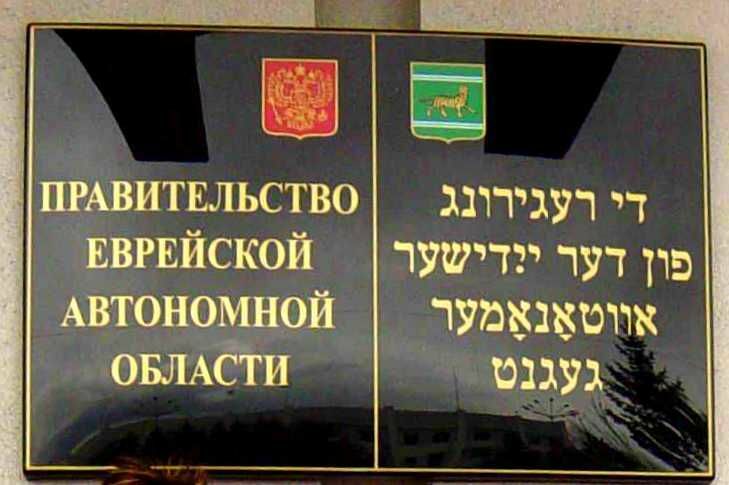 Those who enter the Jewish Autonomous Region by car or bus are greeted by sign welcoming them to the Smidovich District, one of five districts in the region. The sign is decorated with the symbol of the Region – a striped tiger walking between two blue and white stripes on a green background. The background symbolizes the taiga forest and the blue stripes are the two central rivers in the region – Bira and Bidzhan. The stripes also allude to the Jewish prayer shawl, the tales. The Bolshevik Pyotr Smidovich served until his death in 1935 as the chairman of the Komzet, the state organization charged with managing Jewish settlement in the USSR. The urban settlement of Smidovich at the center of the district constituted an important station in Jewish settlement in the 1930s. A few Jewish families still live in Smidovich, located about halfway between Khabarovsk and Birobidzhan. The Jewish community of Birobidzhan supports them. The approach to the Birobidzhan is announced by a large cement obelisk with the name of the city engraved in Russian and Yiddish. A sharp eye will note a cosmetic change to the Yiddish writing – the Hebrew letter Nun Sofit has replaced a Nun, after sweeping changes to the Yiddish language were implement in the Soviet Union. The change was not made on the sign over the city's train station. A few kilometers after the obelisk to the left of the road, there is an old neglected cemetery, almost entirely sunken into the swamp and covered with undergrowth and trees. It is still possible to find Jewish gravestones from the 1940s through 1960s. The headstones are engraved in Yiddish, Russian and even Hebrew. They are marked with both a Soviet star and a Star of David as well as other Jewish symbols. Older headstones have not survived the trials of time. Upon entering the outskirts of the city, the road curves right and merges with Sovietskaya (Soviet) Street, formerly named after Henech Kazakevich, a Yiddish cultural activist during the early settlement of Birobidzhan. Previously it had been named after the settlement Valdheym, located 12 km south of the city. The street is lined with typical Soviet blocks, occasionally marked with names of corporations. 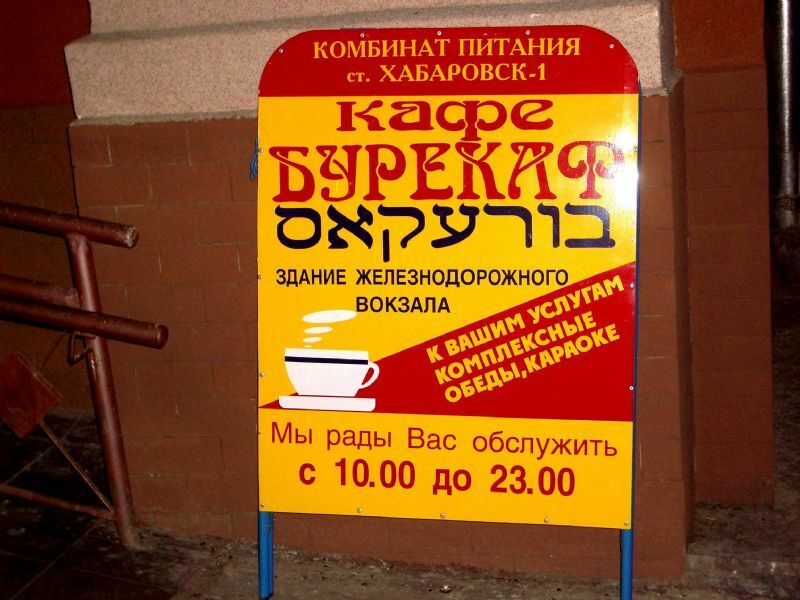 Some include Hebrew letters alongside Cyrillic letters in the "Jewish" style, known as the Birobidzhan font. Downtown is about 3 kilometers from the southern entrance. About halfway to downtown, on the right side, at the corner of Mayakovsky Street, the one-story wooden Beit Tshuva has served as a synagogue for more than 20 years. It is recognizable from the road by the Stars of David on the walls and the rather clumsy menorah on the roof. There is no regular quorum at Beit Tshuva. In the low-ceilinged prayer hall there are two unique holy arks, the legacies of two prior synagogues, one of which burned down in the 1950s. The central bus station is not far from the train station. The train station is typical provincial Russian train stations, built in less than a year starting in 1936. It replaced a pathetic wooden hut that stood on the other side of the tracks and greeted immigrants at the time. 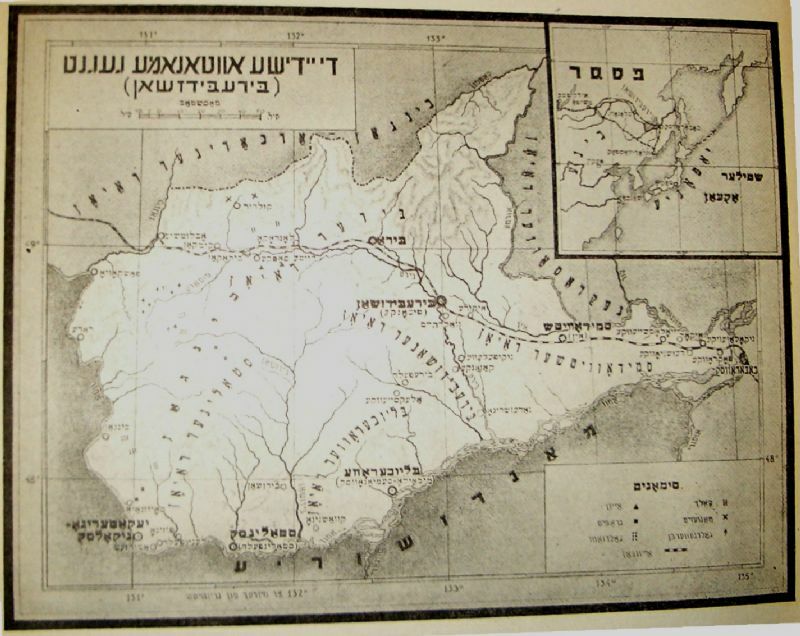 The station opened after an injunction ordering the Trans-Siberian Railway to stop regularly at Birobidzhan, considered an achievement for the establishment of the Jewish autonomy. The original building – which also houses a restaurant and hotel – was constructed primarily by gulag penal camp prisoners working in the region. The station was recently renovated and a covered entrance from the track side was added. The principal innovation is not in the structure itself, but in the exit from the station to the street where an eight-meter golden menorah with a clock stands. The menorah has become a symbol of the region. It stands at the center of a colorful fountain, one of three fountains in the city. To its right, in honor of the first settlers, is a large iron statue of a horse and cart driven by Sholem Aleichem's heroes Tevye the Milkman and his wife Golda. This is where construction of the first socialist Jewish city began in 1930, based on a tiny settlement Tikhonkaya, which consisted of 200 rural homes. The first measure was to stretch planks across the huge puddles that covered the area slated for the city. The street parallel to the tracks is Kalinin Street, named after the chairman of the Central Executive Committee of the USSR Mikhail Kalinin, who envisioned Birobidzhan. There are still two-story wooden buildings on the street, immigrant quarters, the insides of which are almost unchanged since the 1930s. There are other such shacks throughout the city, but they have long since ceased to symbolize the city. Downtown is not large and all the historic sites – some marked with Yiddish signs – can be covered in a two-hour walking tour. Across from the train square, stretches a wide, well-planted boulevard. One side is Oktiabr'skaya (October) Street named after the 1917 Bolshevik revolution. This was the first street constructed in Birobidzhan and by the late 1960s it had become a central pedestrian mall, the city's "Broadway". About 300 meters from the station square, a street to the right leads to Victory Square. In its center is a large monument to the Soviet victory in World War II. At the foot of the monument stand large basalt stones engraved with the names of fallen soldiers from the region, including many Jews. To its left, are stones engraved with the names of more recent war dead from the wars in Afghanistan and Chechnya. Across from the monument hidden among the trees is a small Pravoslavic Chapel, built in 2001 also in memory of the war dead. Until the 1980s, this was the favored gathering spot of the Birobidzhan elderly, who played chess and debated world politics in alternating Russian and Yiddish. The former Birobidzhan hotel, across the road, operated in the 1930s as the first restaurant in town: a bearded Jewish man in a doorman's uniform welcomed visitors and immigrants from abroad danced the bourgeois foxtrot to the strains of the Kamenets-Podolsk Klezmer Band. In 1947, one of the great Yiddish writers of the 20th century, Der Nister, stayed at the hotel for three weeks. He came from Moscow to preach the importance of Jewish-Soviet education. A few meters further, the "Jewish Compound" sprawls behind a fence decorated with grapevines and menorahs. It houses two charming buildings, the new synagogue Beit Menachem, and the community center "Freyd" (Yiddish for joy). 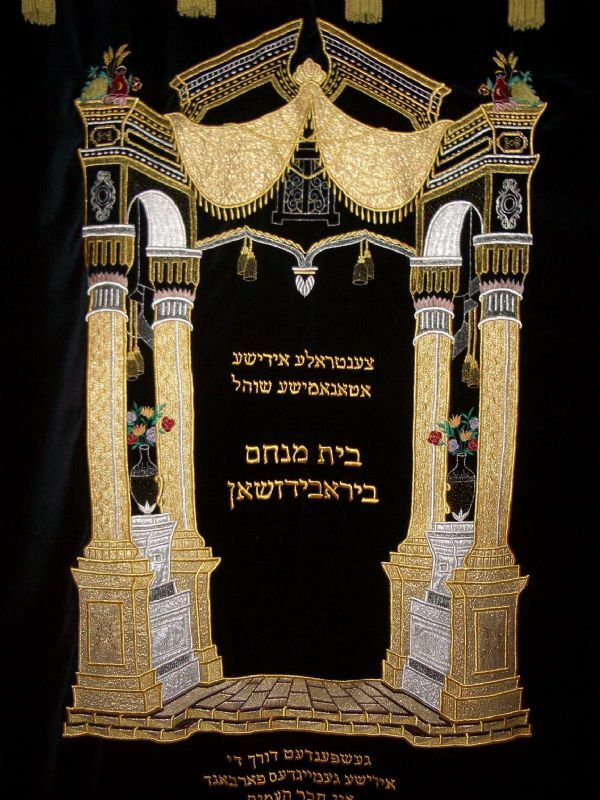 The synagogue's interior design is unusual and it also houses a small but important Jewish museum including recently-discovered items from the archive of the old synagogue, Beit Tshuva. The community center includes a library and a monument to Holocaust victims in the entrance. Across from the Jewish Compound, on the right side of the street, next to the copper statue of a rabbi with a shofar, the Kaganovich Yiddish Theater once stood. Built in 1934, it could seat 450 and was renovated by Japanese prisoners of war in 1946. However, it was closed by state order in 1949. In 1937-38, the theater was managed by the brilliant director Moshe Goldblat, founder of the Gypsy theater "Romen" in Moscow. The building was used for children's activities for many years, but was torn down in the 1970s. This was the only building in the city built according to Bauhaus principles. The actors, mostly graduates of Moscow Yiddish theater schools, lived nearby in two "artists homes" that still face Kalinin Street. About fifty meters further, is the three-story printing house, built in 1940 to house the newsrooms of two regional newspapers, the Birobidzhaner Stern published in Yiddish and the Birobidzhanskaya Zvezda published in Russian. On the first floor in the corner like a lumbering museum exhibit, stands a linotype machine like those in use until the 1990s, when newspaper layout was computerized. Alongside the machine are stacks of boxes of lead letters used in manual typesetting, including the Hebrew letters used not long ago to build the Birobidzhaner Stern. The newspaper is still published today in Russian with a two-page addition in Yiddish once a week. On the front of the building, one sees a memorial plaque for a newspaper employee from the 30s, poet and author Emmanuel Kazakevich (the son of Henech Kazakevich). Other Yiddish authors also worked here, including Yosef Rabin, Hirsch Dobin, Heshl Rabinkov, Buzi Olevski, Salvador Borjes, Hershl Vinokur, Haim Maltinski and Yisroel Emiot. Across the street is an impressive 1940s-era building with two entrances: one is the regional library named after Sholem Aleichem and the other is museum. The library, formerly named after Mendele Mocher Sforim and located in a small wooden building. A narrow room is now allocated for national literature, including about 2,000 books in Yiddish that survived the pogrom against Jewish culture in the late 1940s and early 1950s. There were once thousands of Yiddish and Hebrew books here, including rare manuscripts, with the aim of creating the national Jewish library. The neighboring museum houses a small permanent exhibit dedicated to Jewish settlement. Under glass is an important historical document – the state order granting lands for the perpetual use of the immigrant kolkhoz in Valdheym. One of the museums founders is the Yiddish author Dov-Ber Slutski, who was acquainted in his youth with both Mendele and Bialik. Slutski died in a gulag. The next building on Lenin Street is the former Jewish school. This is now School #2 for the study of the language and culture of the Jewish people. It was built in the mid-30s and was one of the first stone buildings. At the time, it was a leading and prestigious school and several local Yiddish authors taught there, including Heshl Rabinkov. In 1949, the last Yiddish class was closed until the 1990s when the school reopened for Jewish studies including Yiddish, Hebrew and Jewish history. The building also housed the music and dance school, established in 1937 by the choreographer of Moscow's Bolshoi Theater, Yakov Yitskhoki. Teachers were trained on the other side of the street at the Jewish Pedagogical Seminary. The institute now serves as one of the divisions of the Far Eastern State Academy for Humanities and Social Studies. Near the school is the first urban green square, in which a small statue of Lenin stood for many years. It now holds a statue of two hands holding the earth – a symbol of brotherhood between the Russian and Chinese people. Near the statue are standing cute penguins and panda bears, the work of the Chinese brethren. A paved path leads to city hall, the first stone building in the city, built in 1934 for the Communist party authorities and the autonomy's executive committee. Party leaders' offices were situated on the third floor, the executive branch was on the second floor so no one forgot who the boss was. In the 70s, the regional authorities moved to new offices near the river. The building, with the remnants of the Bauhaus style (like the "thermometer" window), was transferred to city leaders. Next door is a monumental residence with stores on the ground floor. Together with city hall, the two buildings create a uniform architectural construction. For many years, this was the most luxurious apartment building in Birobidzhan. The founding fathers of the region and the city lived here, alongside prominent figures in the arts, such as the theater's art director in 1947-48, Alex (Eliahu) Stein, one of the founders of the renowned Vilna Troupe Yiddish Theater, who had fled Poland during the war. Next to the building is the central Birobidzhan traffic artery, Sholem Aleichem Street. On the left side of the road, on the second house after turning down "Theater Alley" (Teatral'nyi pereulok), a modest plaque commemorates the poet Luba Vasserman, who immigrated to Birobidzhan from Palestine in the beginning of the 1930s. Vasserman was arrested in 1949 and sent to the gulag for seven years for "Jewish nationalism" and "cosmopolitanism" like most of her local peers. Across from Luba's house, a Yiddish sign in Cyrillic letters proclaims "Di vokh", the first commercial newspaper in Birobidzhan. The idea for the paper was conceived in 1991 in the offices of the Birobidzhaner Stern by my mother, Maya Kotlerman, who served as its first editor-in-chief until 1994. Its circulation outdid its predecessor in a short time. The alley ends in the largest square in the city, in which stands a large statue of Lenin, carved by the Jewish-Soviet sculptor Lev Kerbel. Lenin is holding out his hand toward the Bira River. To his left is the government building of the autonomous region and the sixteen-member "parliament" ("Gezetsgeberishe farzamlung" according to the sign in Yiddish). To Lenin's right is the court. The government building flies two flags: the tri-colored flag of the Russian Federation, and the Jewish autonomy's flag with its rainbow symbolizing multinationalism. The square is closed off by a pedestrian mall that reaches to the banks of the river. Not far from here was the ferry landing that operated until the wooden bridge was built in 1933. Today, a cement bridge stretches from the right-hand end of the mall, which replaced the wooden bridge in the 1960s. The bridge connects the city to a forested hill with a television tower at its crest. Under the tower are a number of overlook points where the city is visible spread out between the river and the rail tracks. The hill, called the Sopka, inspired many Yiddish writers and other artists over the years. Also on this bank is another hill, a little lower than the Sopka. Architect Hannes Meyer hoped in 1934 to build the new city of Birobidzhan along the road between the two hills. On the opposite bank, a group of orderly blocks is visible to the right – the neighborhood named after local WWII hero Yosef Bumagin who fell in the battle for Breslau, now Poland's Wrocław. About 50 kilometers southwest is the cradle of Jewish settlement in the region, Birofeld. Further along on the banks of the Amur River, Amurzet also once constituted an important station in Jewish settlement. Turning left from the new pedestrian mall leads the tourist into the prettiest square, Theater Square, built on the 70th anniversary of the region. The center of the square is a unique fountain which plays festive music on certain occasions. 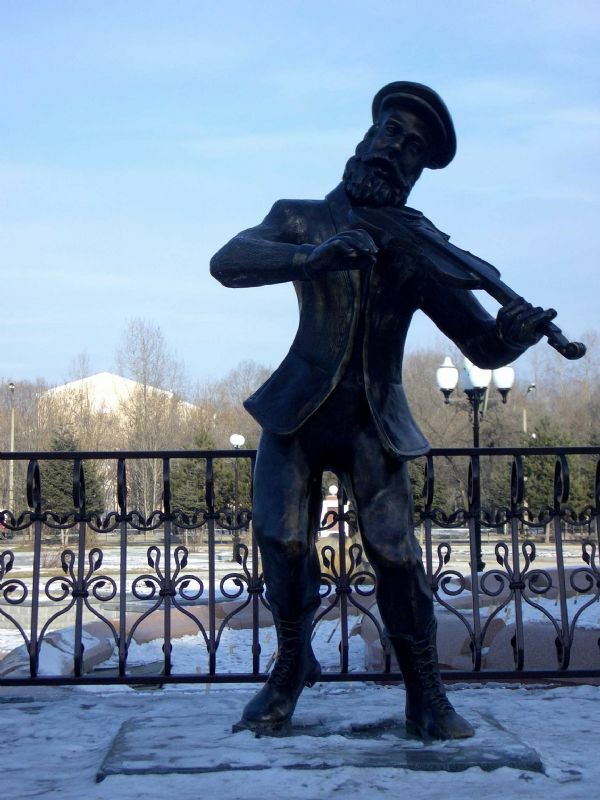 Next to the fountain is small, bearded Jewish fiddler – a copper statue. He is surrounded by statues of the Greek muses, which create a decadent look for the entire square. The monumental structure in the square is the philharmonic orchestra building, constructed in 1984 in the Region's jubilee year. The building was originally intended for the Yiddish repertory theater (KEMT), founded in Moscow in 1977. However, the theater eventually settled in Moscow, visiting Birobidzhan only occasionally. The front of the building is covered in engraved theatrical characters and Hebrew letters are evident. Behind the philharmonic is a municipal park, which had formerly been located on an island. After a dam was built and one of the Bira River's tributaries was dried up, the park was connected to the mainland. There are cafes with Yiddish names such as Tsimes and Freylekhs to our left. A wide traffic artery leads to "Sixty Years of USSR (which no longer exists) Boulevard". The road and the sidewalk are separated by original fences designed in the shape of the Sopka with the television tower on top. In order to return to the train station, we return to October Street. On the right side of the road is the modern local television building "Bira". 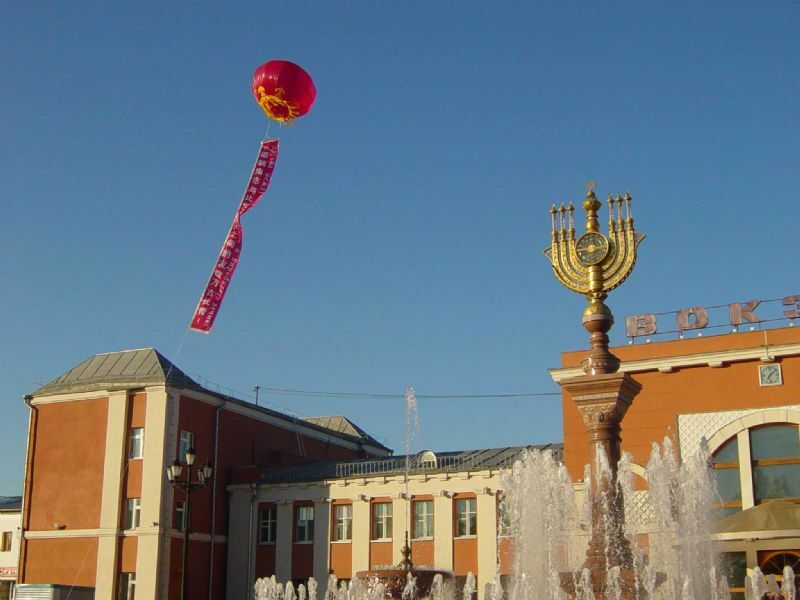 Its corporate symbol includes the menorah, so loved by Birobidzhan residents. Nearby is the modest headquarters of what was once the notorious NKVD (People's Commissariat for Internal Affairs). Political prisoners were collected in the yard here in the 1930s before being sent to prison in Khabarovsk. The building was recently enlarged and converted into a branch of the Federal Security Service. On Sholem Aleichem Street, a cinema is revealed to us as we head to the train station. Until recently, it was known as Rodina (homeland) and before the campaign against Jewish nationalism it was called Birobidzhan. This pseudo-classical building was built in 1937. Until its construction, residents watched movies in the Yiddish theater. The cinema has two screens and a large lobby where art exhibits and other events are often held. To the left stands the auditorium on exedra columns. In the 1960 through 1980s, the auditorium hosted the Yiddish Folk Theater, established by the actors from the professional theater that had closed, including Luba Vasserman's husband, Argentinean actor Moshe Bengelsdorf. The hall now houses a contemporary art museum. A new pedestrian mall to the right is known by the locals as Arbat, after Moscow's famed pedestrian mall. In the end of the mall in late 2007, the city's third fountain was built, "Noah's Ark". Dozens of floodlights create an impressive rainbow of color in the fountain's waters – like the rainbow on the regional flag. 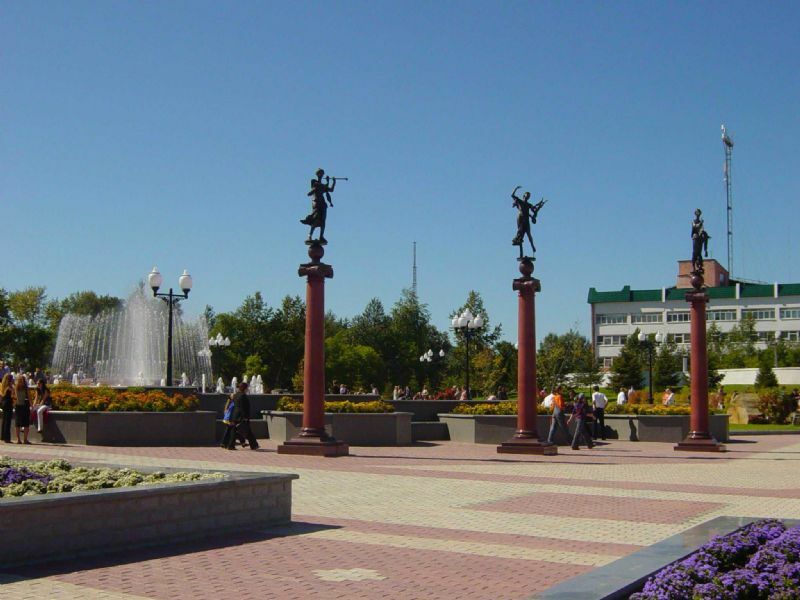 To the right of the fountain are the marketplace and the city's lone hotel "Vostok". A menorah decorates the hotel restaurant's menu above offerings of Birobidzhan-style schnitzel, meat in sweet and sour sauce (esikfleysh) and soup with mandelakh (not kosher). The entrance to the hotel is "watched" by none other than Sholem Aleichem himself, seated on a chair that rests on a die, surrounded by a relief of the protagonists of his works. 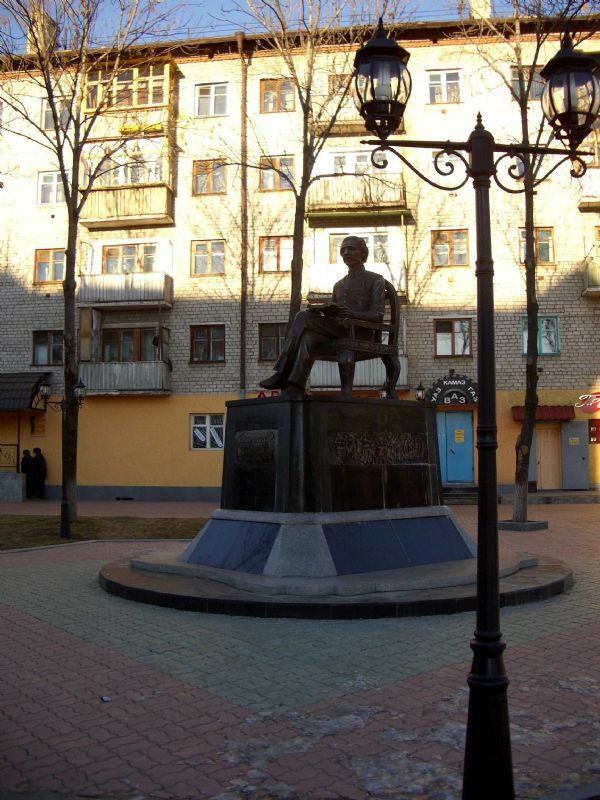 Sholem Aleichem greets visitors of the epononymous street, named after the lauded writer in 1946 when Birobidzhan residents marked the 30th anniversary of his death. Across from the Sholem Aleichem statue at the corner of a busy junction, stands a massive building: School #1, built in 1940. Until 1943, Professor Boruch (Boris) Bruk taught here. 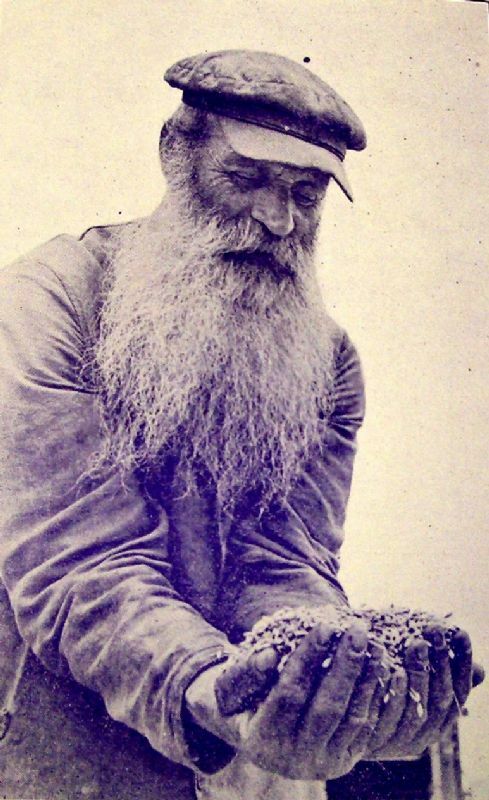 Bruk headed the expedition that determined the location of the future autonomy in 1927. Left of the school the Foreign Languages Faculty of Far Eastern State Academy for Humanities and Social Studies is situated. Since 1989, this has been a seminary for Yiddish teachers. Around the corner to the right, is the beginning of Buzi Miller Street, named after a Yiddish author who moved to Birobidzhan from Kharkov (Ukraine), spent many years in the gulag and died in one of the homes on this quiet street in 1988. Broad steps at the beginning of the street lead to the headquarters of the government construction company Birobidzhanstroy. On the third floor, long-time construction contractor Fira Kofman has established a small museum with a number of cardboard models of municipal buildings, including the destroyed Yiddish theater. The walls of the museum are decorated with tools, pictures and documents. 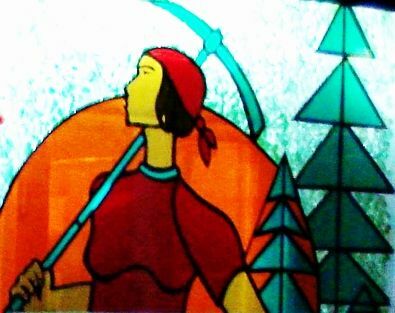 Stained glass windows designed in the socialist realist style depict vigorous men and women builders at work. They wear red hardhats and kerchiefs and are determinedly constructing the "first Jewish socialist city in the world".